April is, of course, National Poetry Month, and there is good news to report this year. For a period of time, well-chosen and well-illustrated poetry compilations were as rare as hen’s teeth in the children’s book world, mainly because of the costs of poetry permissions. But recently, thanks to the success of poetry picture books, we have been getting some poetry anthologies worth cheering for. 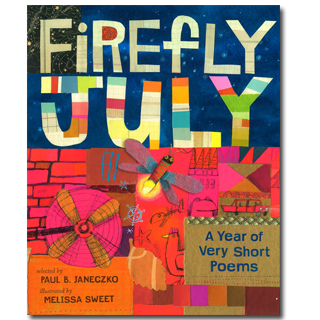 Such is our title of the day, a 2014 title Firefly July: A Year of Very Short Poem, with poems selected by Paul B. Janeszko and illustratred by Melissa Sweet. In an oversized, dazzling volume, the book takes readers through the four seasons with short gems that take full advantage of a few, well-chosen words. The excellence of the poetry alone would lead me to encourage all children’s book lovers to pick up the volume. But that is only half of the book’s beauty. 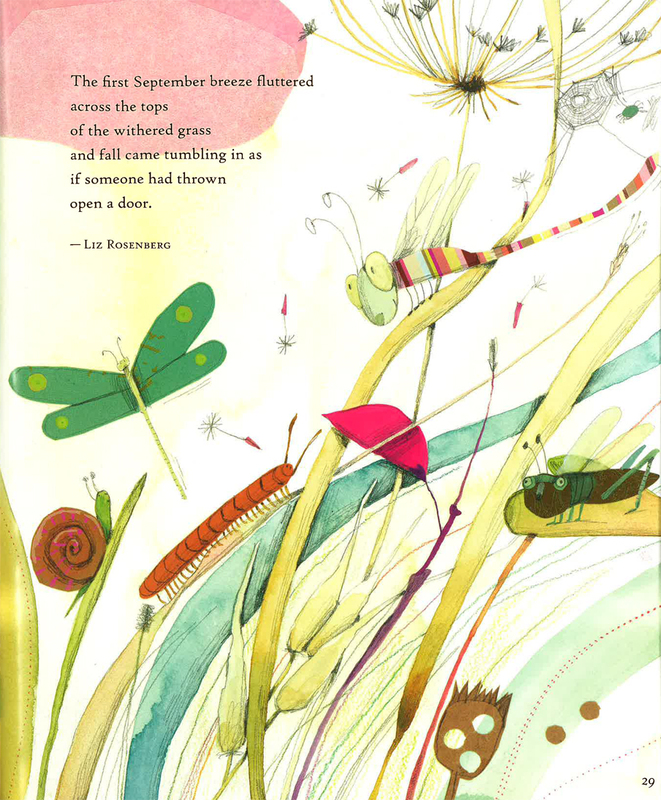 Melissa Sweet (oh, when will she finally win a Caldecott?) has added her magic to ever page in compositions of watercolor, gouache, and mixed media. Just as the poems can be pored over again and again, so can the illustrations, which contain sly details to delight the visually literate. The entire package (text, art, design, and production) make Firefly July the kind of offering you don’t just want to borrow from a library, but that you really want to own. So if you want to celebrate National Poetry Month or a Poem in Your Pocket Day (April 17), or just enjoy a great children’s book, pick up Firefly July. Originally posted April 14, 2014. Updated for . Got it ordered from the library.